A customer satisfaction survey service industry is a type of a survey which helps the various organizations to measure the satisfaction level of the customers, find the unhappy customers and also to find potential advocate. In every company, the customers rating matters the most for the future growth. This particular survey is practiced to get an idea about the opinions and views of the customers about the company and its products. After evaluation, the company can actually find out the various flaws if any, that the consumers are facing with the products of the company. This particular form helps the organization to get back the feedback of the customers. This particular form helps the business organization, in doing a survey among its various target audience and find out various loopholes, along with some good things about its performance in the market. The business organization after receiving the various feedbacks can actually work out on the various problems that the customers are facing. 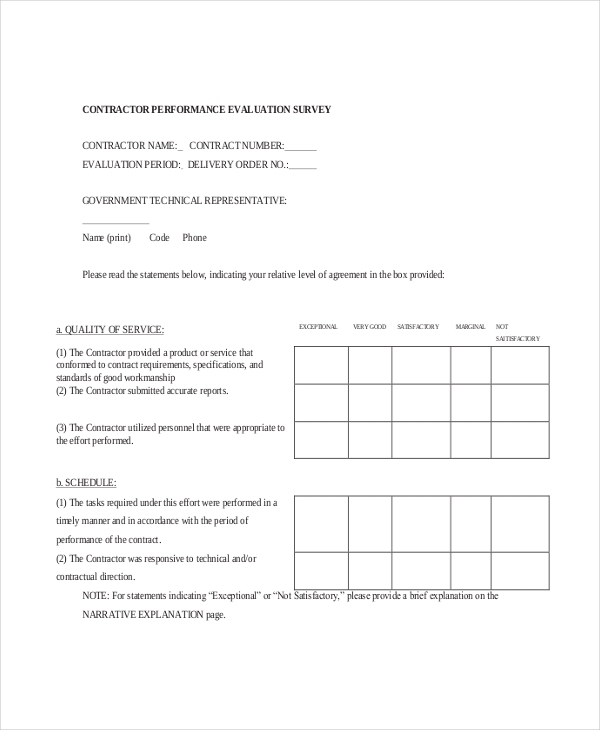 A contractor customer satisfaction survey form is a type of a form given is by a contractor to the customers. This particular form is divided into two parts. The first part is about the identity of the customers and the next part consists of certain questions. The answers to those questions measure the satisfaction level of the customers.A contractor evaluate its performance through the form. 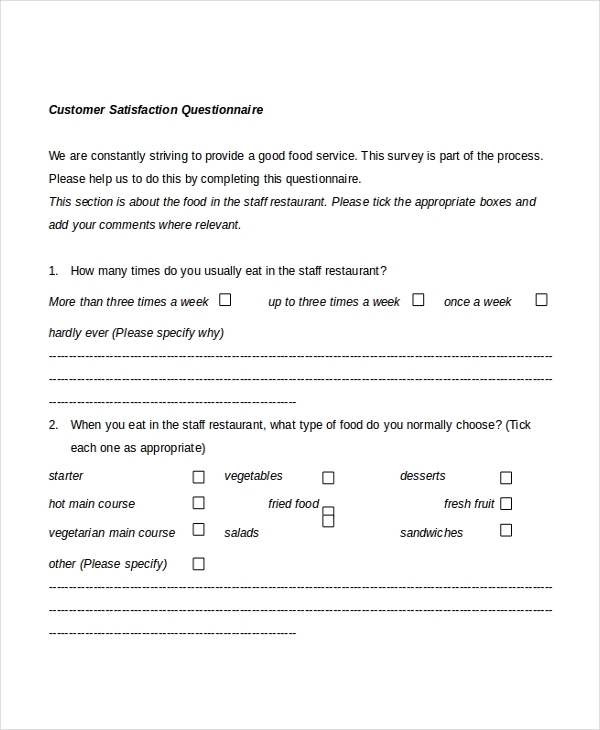 This form is used to do a survey on the preferences of the customers about each type of service served at a restaurant. A restaurant which is completely a service based industry, need this particular form to clearly evaluate the choices and taste of the customers. Through this particular survey form, the restaurants can actually get to know about how the customers are responding to their various services, like the food, or the hospitality. 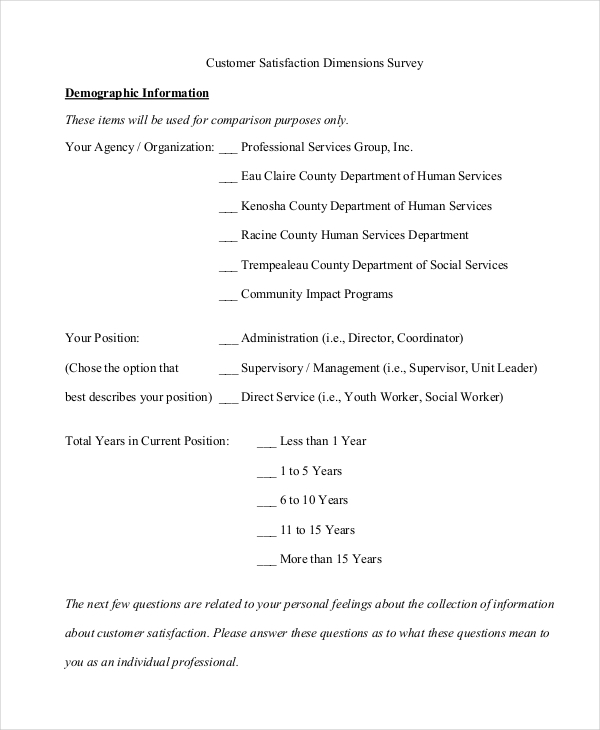 This is a type of a form which is send by an organization to its customers for taking their views and opinions. This particular form highlights each services that an organization offers and requests the customers to give their proper feedback. This helps in evaluating the working process of the organization. 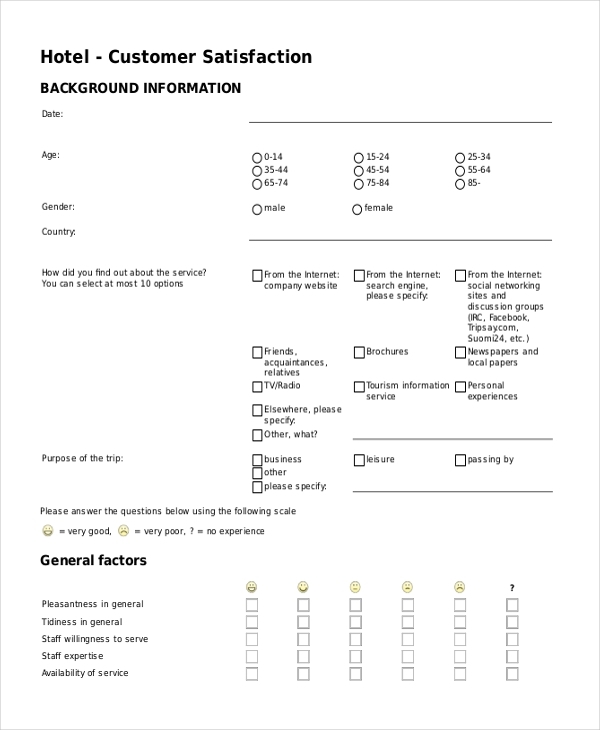 This is a type of a form which is issued by the hotel industry to its customers. As it is a service based industry, therefore it is very much necessary for the hotels to know about the views and opinions of the customers. Through this form the hotel management evaluates the various services that it offers. 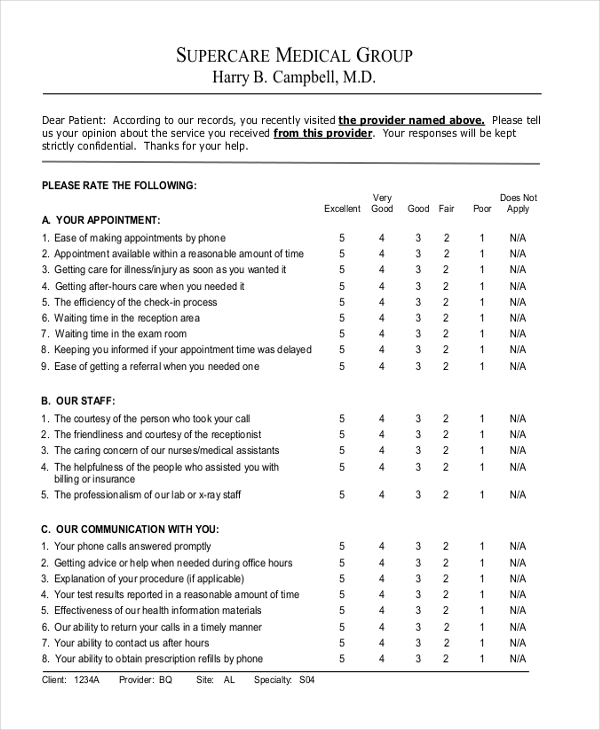 This particular form is issued by the hospital management to the patients. The form is given in order to receive the various feedbacks of the patients about the different services in the hospital. At the end, based on this particular form, the hospital management works on those areas which according to its patients need to improve. 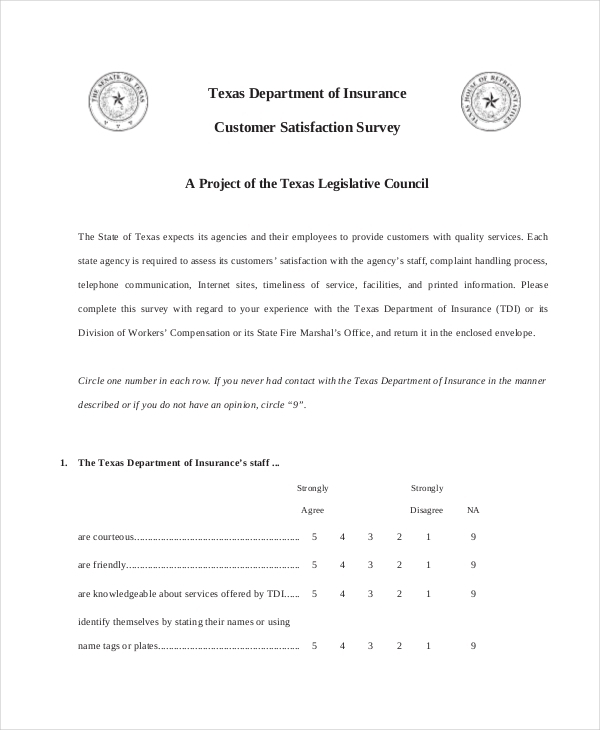 This is a type of a survey form which is needed for analyzing the working of an insurance company or an agent. The form contains various features of insurance and demands customer’s feedback. In accordance with these feedbacks, the organization helps in developing the insurance plans and policies in a better way for the customers. This form is used to evaluate the various services provided by a laboratory for the people. All the views and opinions of the people are reflected in this form and the management of the laboratory acts according to it. In this form, along with the details of the various services in the laboratory, the customer’s identity is also asked for in order to analyze the category of the customers. In any organization, logistic is considered to be one of the most important sections. This form is used to evaluate the logistic of an organization based on customers taste and preferences. The form contains all the logistic services that an organization offers and after the customers put their feedback, the company tries to regulate the shortcomings if any. 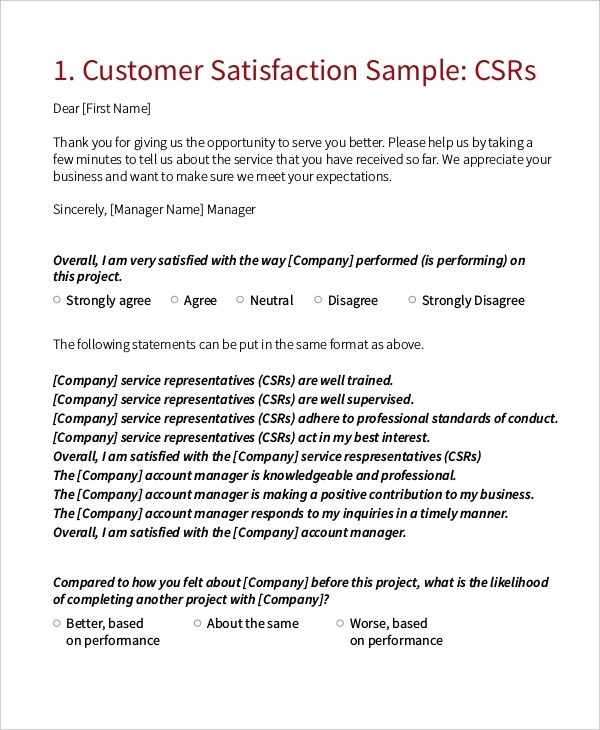 What is a Customer Satisfaction Survey Form? 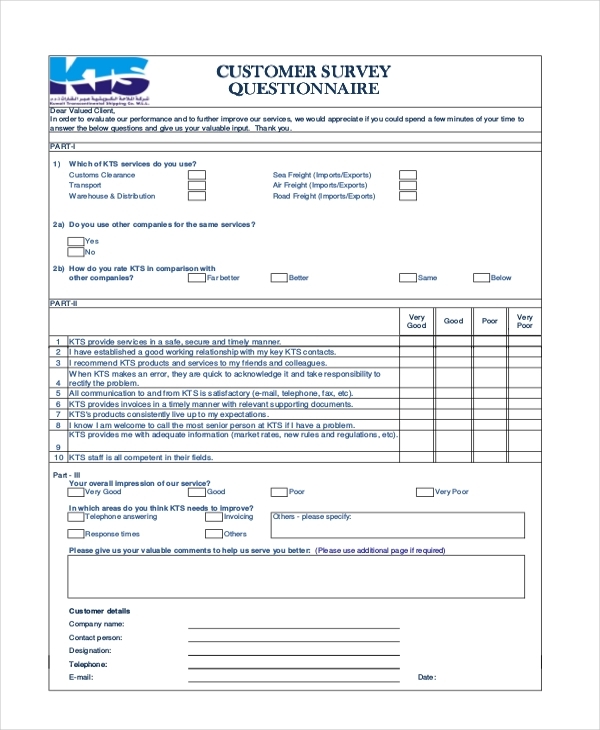 Feedback is proper and up-to-date – This form helps the companies in getting an up-to-date and proper feedback from the customers. There is no delay in feedback. This is considered to be an appropriate method to get the various responses from the consumers. This process is very effective and quite easy for the company to carry out the survey. Standard result- This gives standard result of feedback to the organization. Surveys at frequent intervals help the company to achieve the desired result from the customers. Care for the customers- The surveys gives the customer, a feel that the company cares about them. These are meant to value the ideas and opinions of the various diversified range of consumers. This both way interaction is always better as it creates a good bond between the company and the consumers. The target audience of this particular form is more or less all the consumers of various products. There cannot be any category of customers but every person who is a buyer of a particular product becomes the customer for that company. The companies target the various customers and in return take their feedback in order to develop their products. Many customers have got different opinions about the various items of a company; the company takes each and every opinion seriously and acts on it. A customer satisfaction feedback form will remain to be an important document for every organization dealing with consumers. This form is the only medium through which an organization gets to know the opinions of the consumers about their products and services.